Low-powered Variable Optics (LPVOs) are exploding in popularity. They provide serious advantages when speed up close and precision at distance are equally important. When these advantages mean the difference between winning and losing a match–or between life and death–every little bit helps. I’ve used a handful of LPVOs over the years. I find them the most inclusive option for general use carbines and competition rifles. At distance they give all of the advantages of a traditional higher-powered scope and at close range they’re red dot agile. The only real limitation is the eye box, it is dependant on head positioning. In real world use the advantages easily outweigh that limitation in my observation. 1-6x LPVOs have become all but ubiquitous at 3-gun matches and have seen military use abroad. Today, 1-8x scopes are taking over… and they’re becoming more affordable. Enter the Shepherd Scopes Rugged 1-8x R-Mil. I have been evaluating this entry-level LPVO for several weeks. It’s a second focal plane model available for $550 MSRP at the time of review. The mil-hash reticle and passive ranging can be used with any rifle and ammo. The locking turrets with adjustable index provide the option for dialing-in range and windage adjustments if you have the time. The clear, unobtrusive milliradian subtensions are easy to use when the day calls for speed at distance. To take advantage of either, the R-Mil also features passive rangefinder that stays out of the way until you need it. The scope weighs under 19 ounces (without a mount). The included absolute height mount is a nice touch. It attaches easily and securely. My preference is for the much higher 1.93” scope mounts, but it’s a great inclusion. And at this price, it’s easy to justify a change if you want it. My primary test rifle and ammo are capable of sub-MOA performance and the bright clear sight picture at 8x made it almost easy. The initial zeroing day was more of a pleasure than I expected. The range I used had electronic targets with a very detailed display for monitoring hits. By the end of the first magazine, I was shooting 5 round groups at 0.7 MOA at 100 yards. That performance did not change and the zero did not shift in my testing. The glass itself is remarkably clear for it’s price point. Whether I shot it at 400 yards or 4 yards it showed me what I wanted, gave me the information I needed, and otherwise got out of my way. 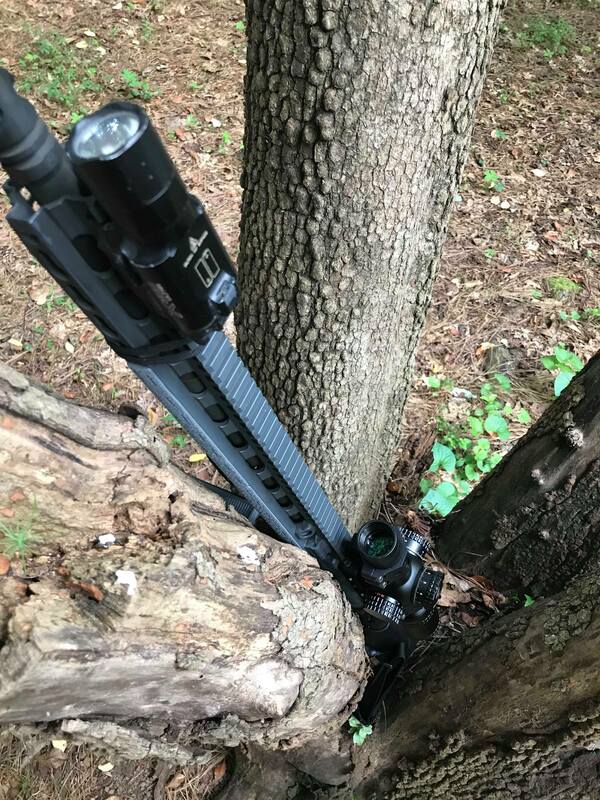 There’s not a lot more you can ask of an optic. A longer throw lever would be a nice touch, but there are aftermarket options available. Shepherd Scopes claims that the Rugged 1-8 R-Mil will handle the recoil of a .50 cal. I didn’t have a chance to test it on one, but it easily handled my abuse. 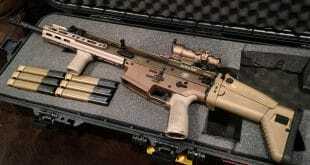 For what it’s worth, I don’t believe in hard rifle cases except in checked baggage and I don’t baby any of my gear. 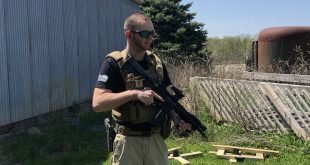 Over several range trips and competition focused training sessions it held zero and showed no real signs of abuse aside from cosmetic scratches. What I call normal use has destroyed some very nice optics. The Rugged 1-8 R-Mil has performed to the point that I trust it to work when I pick it up. 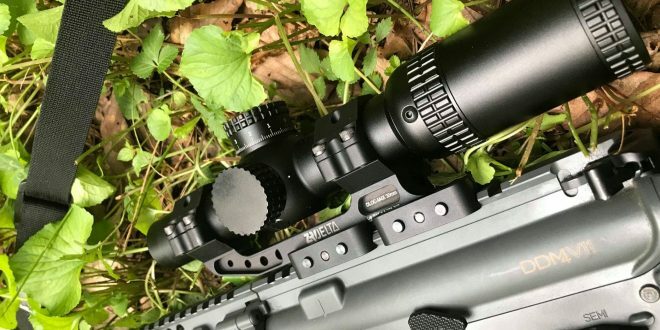 The Shepherd is a second focal plane optic, like all design decisions this implies some trade-offs. What this means is that the reticle subtensions and rangefinding features are only accurate at 8x, every other magnification involves conversion math. I mostly use LPVOs at 1x or their maximum magnification so it wasn’t a problem. Even at only 100 yards, the field of view is plenty at 8x (14.5 feet). 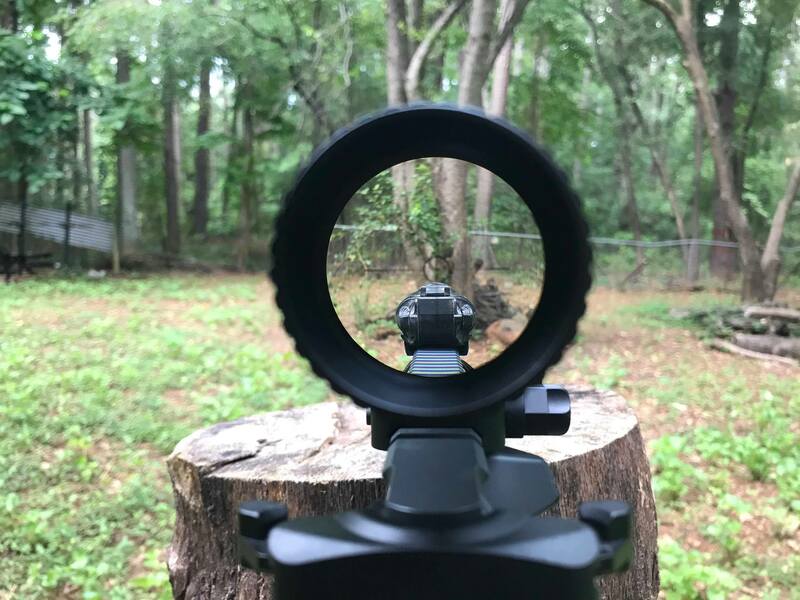 The illumination of a second focal plane reticle is much brighter than first focal plane scopes. In my testing the Rugged 1-8 R-Mil was easily daylight bright in both green and red. Speaking of the green illumination, the option of changing the color is missing from many scopes, especially on the higher-end. 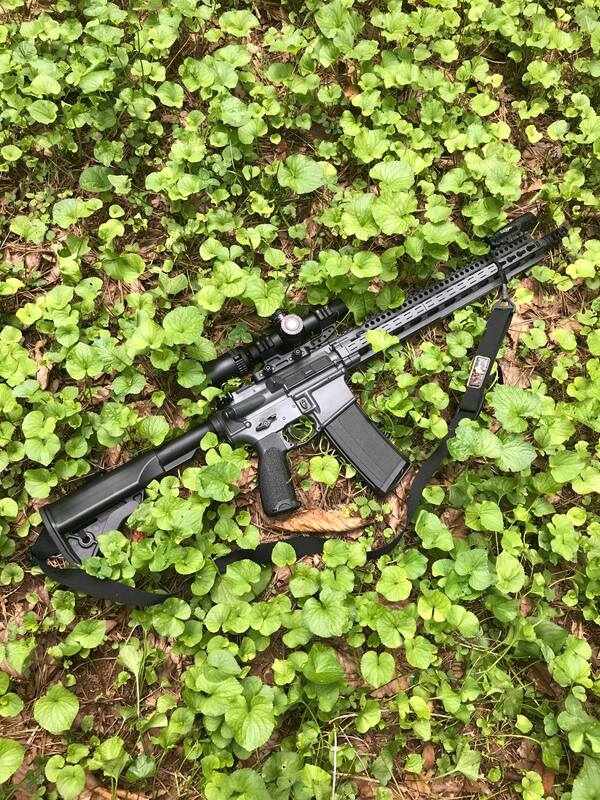 If you have remotely normal color vision your eyes are most sensitive to green, making it easier to distinguish a green reticle from anything downrange. The 5 brightness levels are well-spaced and work from low light to bright daylight; I never found myself hunting for a setting or wishing I could set it in-between them. Like all LPVOs, the battery life is nothing to write home about, and leaving the optic on all the time will drain it. Fortunately, the etched reticle is still crisp and usable without the illumination. 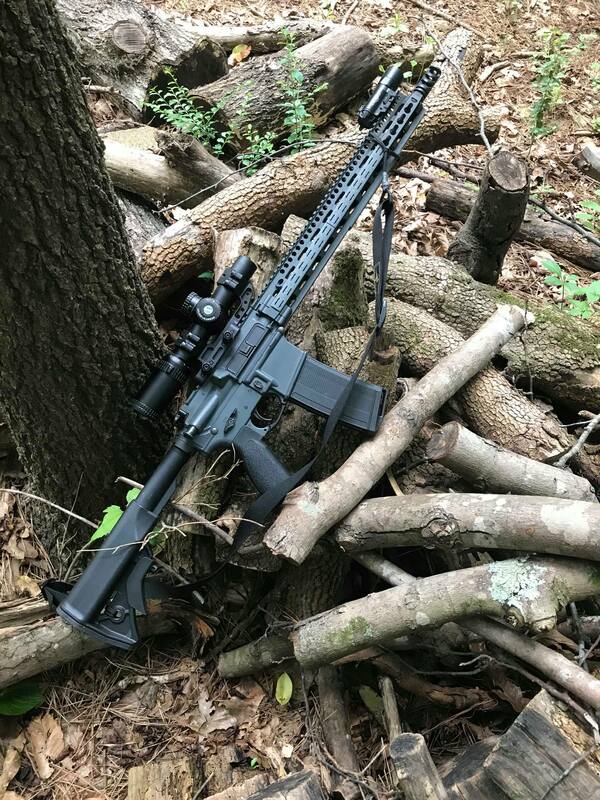 The Shepherd Rugged 1-8 R-Mil is as fast as any LPVO I’ve come across up close, has a very clear sight picture, and covers the useful effective range as far as my rifles and ammo can perform. Bright both in terms of light transmission and illumination, and a fantastic value at it’s MSRP.